Those of you who follow me on Twitter or Instagram will have seen some rejoicings over the weekend. 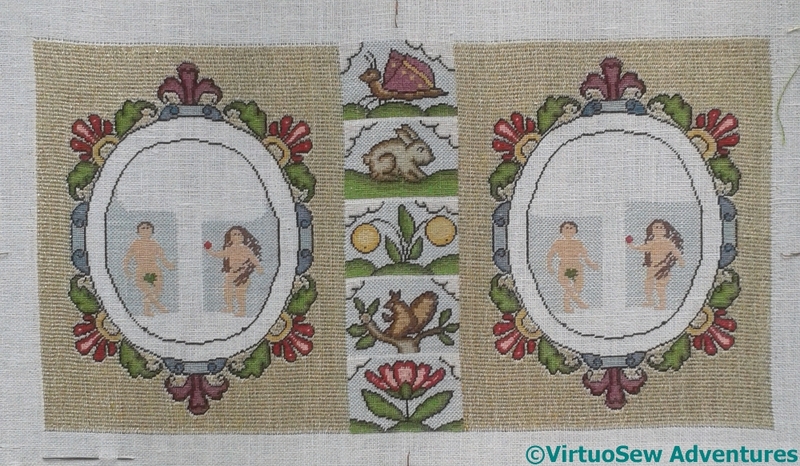 I have been working on the gold stitched background for the polychrome tent stitch for what seems like forever, but in fact it is less than a year – I began the Elizabethan Ground Stitch in October of last year. A serious shoulder problem interfered with my work at my floor frame at one stage, and then I was all taken with with my ideas for the Head of Nefertiti, so it was only recently that I got back to it. And now I have finished that laborious stage, and I can move on to the more complex and intriguing techniques which were the whole reason for taking the course. For instance, this one. 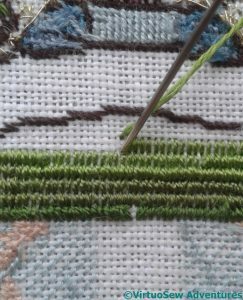 Tricia describes this as a variation on Velvet Stitch, worked in silk thread over what I presume is a fine double ended knitting needle. It makes a perfect spacer for the pile of the stitch, anyway, and arrived with all the other bits and pieces. Tricia tells us to come up through the already occupied hole, to avoid pulling the thread through to the back and reducing the pile. I went a step further and worked it from the back, ensuring that I kept the stitch neat and the stitching going up through the right holes! I must admit I enjoyed this, simple, and straightforward, but with just enough challenge to keep me awake and alert. And here is the first hillock, finished and fluffy. It looks as though it would be beautifully soft underfoot, doesn’t it! Is that a straw you’re using? That’s a great idea to keep all your stitches even. How clever you are to work from the back where you can see and keep the thread under control! The embroidery looks very complex and will take time, but oh, isn’t it a nice design! What an ingenious idea and stitch. 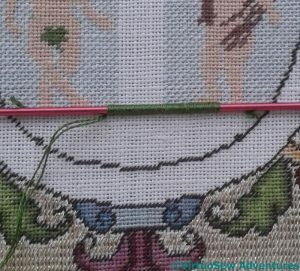 I’ve never heard of this stitch before, of considered using a knitting needle for that matter. I love the effect! The use of knitting needle produced wonderful results!! They look like bullions and much easier to stitch than the originals. Thanks for sharing Rachel! I was wondering if that was another casket design popping up in my instagram feed :). Would love to start mine, but alas, too much other embroidery stuff in the way for the moment. The time will come! That’s a lovely fluffy hillock! How stable are the loops? It is always interesting to see the way you plan and progress. 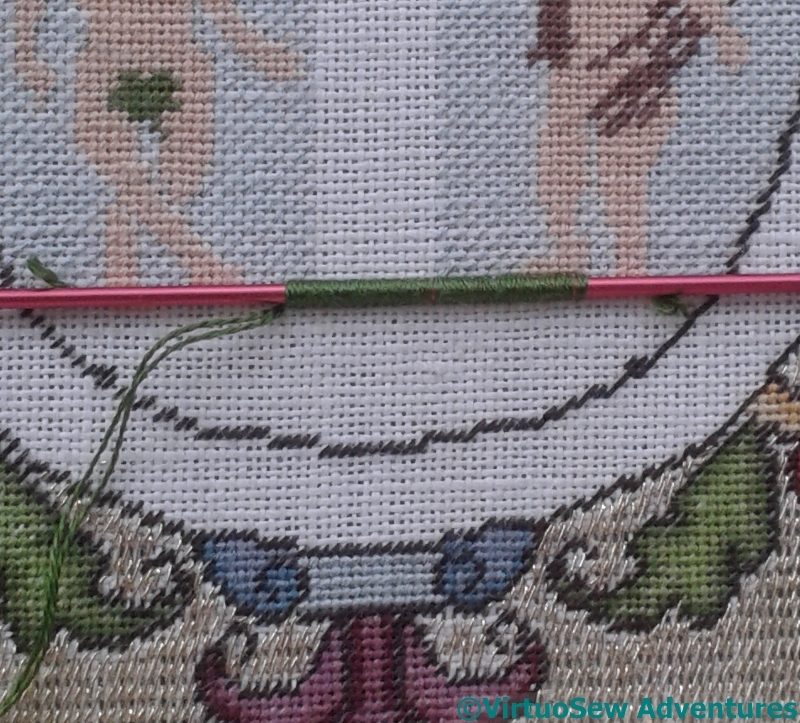 The knitting needle effect is so interesting! Yet again I have learned something new! 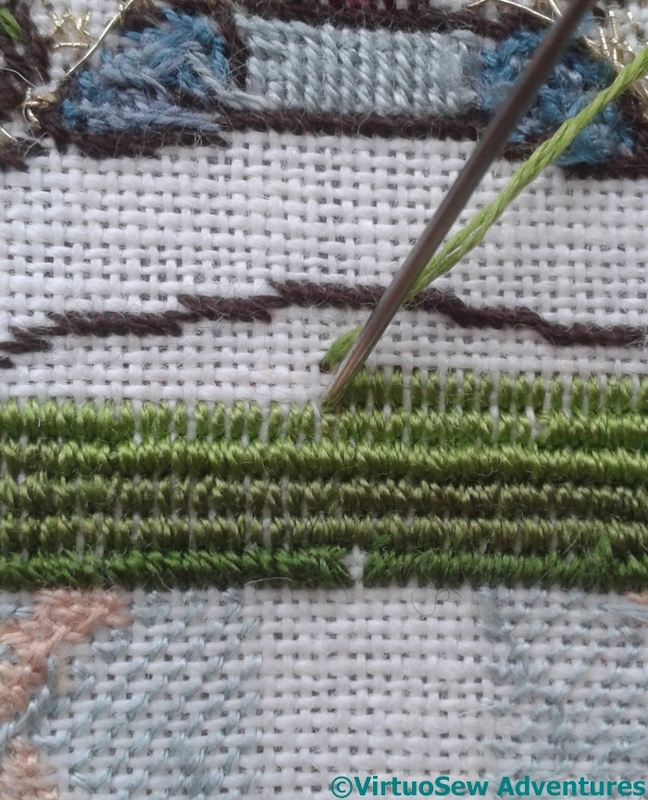 As I have lots of double-pointed needles, I really should try this one – I could have small, medium and high hillocks!! I love that fluffy grass! This grass is really effective. Very vivid stitches. You inspired me to put up needles again. I like that technique and will have to remember it for the future. I’d heard of doing this, but never actually seen it done. Thank you! It does look like it’s ready for a romp!